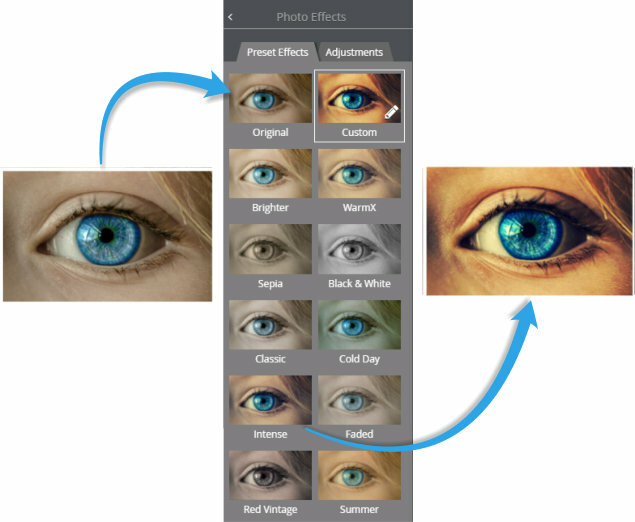 Use the photo effects feature to add photo effect presets or tweak the levels of your photos and images. Just select a photo and then choose Photo Effects from the properties panel. Select a preset from the Preset Effects tab. Notice how your photo appears with each preset thumbnail and how the effect morphs over the main photo on mouseover for a perfect preview. If you don’t fancy any of the presets then you can just apply your own using the settings on the Adjustments tab. Or use one of the presets as a base and tweak that. A tap on the little pencil icon will switch you into the adjustments setting for your selected preset. Your adjusted version appears next to the original back in the presets panel as a Custom preset. You’ll see a lot of different parameters for you to adjust - from the ones that are instantly familiar - like Brightness and Contrast to more sophisticated ones like Saturation, which alters the color intensity. Temperature which makes an image ‘warm’ or ‘cool’ and X-Process which you can use to alter the color channels for some dramatic contrast and saturation effects. Select Tint hue to tint the photo and adjust using Tint strength. Use the sliders to experiment or enter numerical values if you wish. Use the Compare button to toggle between your original and current settings. There is an Effect code at the bottom of the Adjustments panel - if you copy the code (Ctrl + C) you can paste the current settings on to another photo. Select the photo or photos and paste the new code settings into the box. Alternatively copy the photo and use the Paste style option from the Paste menu on the properties panel to paste the settings onto another photo.